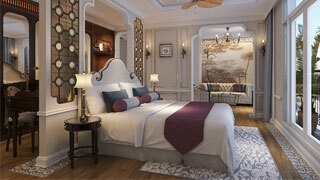 A rendering of a Grand Suite on Uniworld's SS Mekong Jewel. Uniworld Boutique River Cruise Collection is giving guests a sneak peek of its brand-new S.S. Mekong Jewel, debuting 3JAN 2020 as the newest and most luxurious ship on the Mekong river. Its 13-day itinerary will take guests from Ho Chi Minh City to Siem Reap, with visits to Phnom Penh, Angkor Wat and more. The newly-built S.S. Mekong Jewel will feature all-suite accommodations, an indoor swimming pool and two restaurants: a main dining room and an al fresco eatery on the upper deck. Measuring 33 feet longer than the Mekong Navigator but accommodating the same number of passengers – 68 -- means guests have more space and amenities with a high staff-to-guest ratio. The ship is being constructed with sustainable and eco-friendly materials, such as special paint used for the hull that creates less drag, specially designed propellers that increase performance and efficiency, energy-efficient LED light fixtures, automatic air conditioning controls to optimize cooling resources, and a water-cooled air-conditioning system that will save energy. Uniworld has a total of four new Super Ships set to launch in 2020, and a commitment to convert its entire fleet to Super Ships in the coming years.